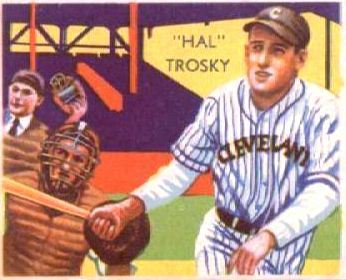 Hal Trosky played first base for the Cleveland Indians and the Chicago White Sox in the 1930s and 1940s. His career reached its apex in 1936, when he led the American League in runs batted in with 162, yet he has largely been consigned to historical obscurity. This anonymity is not only due to the reality that his career overlapped a triumvirate of Jimmie Foxx, Hank Greenberg, and Lou Gehrig, a triumvirate of future Hall of Fame first basemen who held a virtual lock on the position on the American League All Star teams of the mid-’30s, but also because, at what should have been the peak of his career, Trosky was sidelined with two years of severe migraine headaches, pain so debilitating that he became unable to take the field for days in a row. Born Harold Arthur, he arrived on November 11, 1912, to John and Mary (nėe Siepman) Trojovsky. The family, second-generation immigrants from Bohemia, moved to a 420-acre farm outside Norway, Iowa, in 1917. Harold had two sisters, Annette and Esther, and a brother, Victor. After an impressive schoolboy and amateur career, Hal was courted with varying degrees of intensity by the Philadelphia Athletics, the St. Louis Cardinals, and the Cleveland Indians. Graduating from high school in 1930, he was offered a minor-league contract by the Cardinals. Not sure how to proceed, Trosky called on Bing Miller in nearby Vinton. Miller was then a member of Connie Mack’s powerhouse Philadelphia Athletics, who had just played in the second of their three consecutive World Series. Miller was delighted to speak with the boy. Miller knew Trojovsky’s reputation and advised him to do nothing until Miller had had the chance to inform Mr. Mack. Hal drove home quite content, but upon returning to Norway found his father seated in the kitchen with Cleveland Indians scout and Cedar Rapids native Cyril C. “Cy” Slapnicka. Trosky later told Gordon Cobbledick, the baseball columnist for the Cleveland Plain Dealer, “I liked Slap, and after we talked baseball for a while he suggested I sign with him.”1 Evidently, Slapnicka had been aware of Hal’s prowess and local reputation, but hadn’t felt any urgency in pursuing him until he got wind of the Athletics’ and Cardinals’ interest. After almost no deliberation, Hal chose the Indians. He signed his first contract Harold Trojovsky, but from then on used the shorter Trosky, as did his siblings. A contract offer from Connie Mack arrived three days later. Hal returned the unsigned document with a note explaining what had happened and apologizing for the inconvenience. He was touched that Mack took time to respond with his best wishes for the player’s future career. Trosky reported to the Class D Cedar Rapids Bunnies in early 1931, playing for a $65 monthly salary. He was signed primarily as a pitcher, one who had the odd habit of hitting cross-handed from the right side of the plate. Slapnicka, in a visit to the park to check on his prospects, took player and manager aside and suggested that Hal retain his grip but switch to a left-handed batting stance. The change was providential, as Trosky played 52 Mississippi Valley League games that summer as a converted first baseman and, in 162 at-bats, managed 49 hits (including 3 home runs) for a respectable .302 batting average. He followed that mark in 1932 by hitting .307 in 56 games for Burlington of the Mississippi Valley League, and then .331 after promotion to Quincy in the Class B Three-I League. His 15 home runs in 68 games with Quincy summoned the attention of executives in Cleveland, and in 1933 Trosky began the season as a $200-a-month player with the Toledo Mud Hens of the Double-A American Association, the minors’ highest classification. At the close of the Mud Hens’ season Cleveland called, and on September 11, 1933, Trosky started at first in place of Harley Boss. He went 0-for-3 against the Washington Senators’ Monte Weaver, and notched his first hit the next day off Monte Pearson. On the 18th he collected his first major-league home run, off the Boston Red Sox’ Gordon Rhodes. After retrieving the glove, the rookie had to sift through the conflicting emotions of awe in the presence of a living legend and of fear in the form of Lou Gehrig striding to the plate. If possible, Gehrig represented an even greater hazard to Trosky’s well-being than the Bambino, because Ruth generally hit high, arcing fly balls, while Gehrig could rip a vicious line drive off any pitch. Trosky had to cover the bag with second base open, but against Gehrig the only chance to reel in a hard drive was found in playing farther back on the outfield grass. The Babe must have divined Trosky’s fielding dilemma, because he whispered out of the side of his mouth, “Don’t worry about holding me on, kid. I ain’t going noplace. Just drop back a little and play it safe. If he hit one at you up here, it would take your head off.”2 Hal backed off and, true to his word, Ruth stood just a few feet from first and awaited the Yankee onslaught. It wasn’t that big a deal to the Babe, but Trosky never forgot that small kindness. In 44 at-bats that month, spread over 11 games, Trosky hit .295 with a homer, a double, and two triples, and drove in eight runs. The 1935 season proved to be something of a sophomore slump for Trosky, marked by an almost 60-point drop in batting average and a commensurate drop in home runs, from 35 to 26. When mired in a September slump that year, a stretch in which he had exactly one hit in 40 at-bats, coach Steve O’Neill, his former manager at Toledo, suggested that Trosky try hitting from the right side against the Senators. The next day, in the opener of a doubleheader in Washington, Hal came up in the first inning and took a right-handed stance. He stunned his teammates by smoking an Orlin Rogers curve for a single. After a left-handed out in the fifth, he hit from the right side again in the eighth inning and knocked a Leon Pettit pitch into the distant reaches of Griffith Stadium’s left-field bleachers for his 23rd home run of the year. Overall in the two games, Trosky punched five hits in ten at-bats. Three singles and a home run came from the right side, and one long double from the left. It proved to be the last time he would try switch-hitting. The 1934 model Hal Trosky returned for the ’36 campaign. Trosky put together a 28-game hitting streak and broke his own team record for home runs in a single season when he hit number 36 against the Senators. Although the AL pennant went to the Yankees, it was a memorable season for Trosky, as he led the league in RBIs (162) and total bases (405). His RBI total over his first three seasons was greater than the totals amassed by Gehrig, Foxx, or Greenberg over their first three years. After his 1933 call-up, Hal had wed longtime sweetheart Lorraine Glenn (from Norway, Iowa), and in September of 1936 they welcomed their first son, Harold. Baseball ran in the genes. Twenty-two years later Hal Junior made it to the major leagues for a late season two-game cup of coffee as a pitcher with the White Sox. The years from 1937 to 1939 were relatively stable for both player and team. Rather than succumb to the hyperbole and inflated expectations that followed his 1936 season, Trosky chose to focus on improving his fielding. After achieving the rather dubious distinction of leading American League first basemen in errors in 1934 and 1936, he worked diligently to improve his footwork around the base. Along with the subsequent decline in errors, he sought a better approach at the plate, and elevated his batting average to .334 in 1938 and .335 in 1939. Naturally his home-run totals declined, but he found that he could still drive in more than 100 runs per season by putting a higher percentage of balls into play. Trosky and the Indians continued to win, but were competing with a Yankee juggernaut that dwarfed the rest of the league. By 1939 the Indians had named Hal team captain. Trosky agreed not only for the extra $500 stipend, but because he felt that he could serve as a buffer between some of the less experienced players and their acerbic manager, Oscar Vitt. In midseason Trosky lifted himself from the lineup and let understudy Oscar Grimes play a few games at first. Trosky never admitted it to the team, but there were times when his head absolutely throbbed. The season ended with Trosky recording only 448 at-bats, the first season since his 1933 overture that he appeared in fewer than 150 games. It was becoming difficult for him to bring the necessary intensity to the park each day. He was only 26 years old when the season ended, but the pain from the headaches sapped his vigor. Over the winter the headaches faded. Trosky consulted several doctors in Cleveland and in Cedar Rapids, but none was able to pinpoint the source of his discomfort. As the frequency of attacks decreased, he threw himself into his farming and family life, and by the end of the offseason, he was eager to return to baseball. Events in spring training of 1940 provided unmistakable indications of how the Indians would perform on the field, but not even the closest observers could have predicted the off-field show that was gradually unfolding. The players felt that their manager, Vitt, was antagonistic and spiteful, despite the press’s portrayal of him as suffering and misunderstood. The first week in June brought the cauldron to a boil. On June 10, after a week of inconsistent play, the Indians were rained out in Boston and the players spent the day in the hotel lobby dissecting their misfortune. They put the blame for the team’s struggles on Vitt. Some of the players advanced the idea of trying to dump the manager, but team captain Trosky counseled patience. The slugger was a proud man, and wanted no part of pointing public fingers at anyone, even though Vitt’s words had repeatedly stung him. The following morning the players checked out of their rooms early. At breakfast they again discussed solutions for the “Vitt problem.” Later, on the train ride from Boston to Cleveland, veterans Ben Chapman and Rollie Hemsley reportedly called Lou Boudreau and Ray Mack to their berth and told the young infielders that some of the players were circulating a petition calling for Vitt’s ouster. Boudreau and Mack, along with Al Smith, Beau Bell, Mike Naymick, and Soup Campbell, were excused from participating. In a meeting with the rest of the players, pitchers Mel Harder and Johnny Allen told the team that they would go to owner Alva Bradley alone to discuss the problems, and Harder was appointed the voice for the players. On June 13 tragedy found Trosky. As the team’s train pulled into the Cleveland station, Hal received word that his mother had died suddenly in Iowa. Trosky went straight from the train station to the airport, while Harder called Alva Bradley’s office seeking an appointment with the owner. Instead of sending Harder alone, ten more of the dissidents accompanied him to Bradley’s office to show him the sincerity of their grievance. The players were all seasoned veterans, men who worked in the offseason not by choice but by necessity, and they were men who understood the consequences of their actions. Clearly, this was no idle grumbling about a stern taskmaster. Vitt had wounded them deeply enough to spur those extraordinary measures. The players told Bradley that Vitt had to go if the team was to compete. They outlined four specific grievances, each of which Bradley later confirmed as true, and demanded that the owner take action. Trosky even telephoned Bradley from the airport to ensure that his absence wouldn’t be misconstrued. Despite his personal misgivings about the action, the team captain would not even consider standing idly by while his teammates pressed the issue. Bradley told the players that he would look into the matter and warned them that if word of the meeting was released, the players would be ridiculed forever. Gordon Cobbledick of the Cleveland Plain Dealer found out almost immediately. The Indians won the game that afternoon, but it was the insurrection that was front-page news in the Plain Dealer the next morning. The headline for the story was physically larger on the printed page than that afforded to Hitler’s invasion of Paris. Bradley went on the record saying that he would take no immediate action regarding his manager or his players until he had a chance to talk with the team captain. Trosky’s involvement in the “Crybaby” incident, rumored so heavily by the writers, probably was not nearly as great as some supposed. Three days after the story broke, on the back page of the Plain Dealer, an apology of sorts was printed that stated that neither Oscar Vitt nor Hal Trosky had ever claimed that Trosky was bent on usurping Vitt’s authority. In 1951 the Cleveland News unearthed and published a memo from Alva Bradley concerning the incident. It read in part: “We should have won the pennant. … Our real trouble started when a group of 10 players came to my office and made four distinct charges against (Vitt) and asked for his dismissal. The four charges made against Vitt, on investigations I have made, were 100% correct.”3 At the end of the season, Bradley fired Vitt. The latter caught on with the Portland Beavers of the Pacific Coast League the following season, but after finishing 26 games below .500, he resigned rather than await another termination. After managing the Hollywood Stars of the PCL to a seventh-place finish in 1942, Vitt was through as a manager. On August 11, 1940, in St. Louis, Trosky became the 17th major-league player to clout 200 home runs. He finished the season batting.295. His 93 RBIs marked his first full major-league season in which he failed to drive in at least 100 runs. He hit 39 doubles and a team-leading 25 home runs. The headaches hit hard again in August and September, but Hal loathed missing any game in the tight pennant race. The Indians finished second, one game behind Detroit. Trosky’s migraines proved too much for him in 1941. They were striking with no notice and leaving a wake of debilitating agony. For a hitter who made a living off fastballs, he was powerless against a blurry white apparition that he said sometimes looked “like a bunch of white feathers.” He played less and less. The migraines were now almost unbearable. On August 11 Cleveland began a seven-game road trip without their slugger. Trosky was left home with Oscar Grimes assuming first-base duties. Trosky rejoined the team for its last stop, in Chicago. In the sixth inning of the opener of a doubleheader at Comiskey Park, Trosky’s Indian career came to an abrupt end when he fractured his thumb in a collision with White Sox pitcher Ted Lyons. The slugger missed the final 42 games of the season and, as it turned out, never wore Cleveland colors again. Trosky passed 1942 and 1943 on his farm in Iowa. He devoured news of the war, farmed, and despite some interest from the Yankees, waited for a call from the draft board. He was evidently a decent farmer, averaging production of over 90 bushels of corn per acre in a time before the advent of modern farming technology. But he wanted to contribute on the front lines. Trosky worked out for the White Sox and in November the Indians, perhaps willing to remove a piece of the Crybabies incident and aware that he was not the offensive force he had been earlier, sold his contract to Chicago for $45,000. As if an echo of Cleveland’s judgment, the Army officially declared Hal Trosky 4-F, unsuitable for military service, in March 1944, due entirely to his history of migraines. Despite a treatment protocol of vitamin shots, the Army wasn’t willing to take a chance on a compromised recruit. The White Sox took advantage of the Army’s concession. Trosky played baseball in 1944 like a man with great talent who had been out of the game for two seasons. In April he logged two multi-RBI games, but he showed no consistency. His play was marked by a succession of solid games followed by mediocre performances. Migraines notwithstanding, Trosky managed ten home runs in 1944, which was enough to lead his team in that category. Including his 1944 season, Hal led his teams seven times in home runs. According to the SABR Home Run Encyclopedia, Trosky homered in nine different parks and off 112 different pitchers during his career; his most frequent victims were Tommy Bridges and Bump Hadley. Of his 228 home runs, 106 were hit on the road, and 122 at home. No one but Earl Averill hit more at Cleveland’s League Park. At the end of 1944, with the White Sox in seventh place after winning only 71 times, Trosky called it quits again. He headed home for some hunting and farming, and to await another possible call-up to support the war effort. In 1945 Trosky worked at the nearby Amana Refrigeration plant. The headache pain had been, in part, controlled by vitamin B-1 shots and by a significant reduction in his daily intake of dairy products. It was ironic that an Iowa dairy farmer was allergic to the very stuff his animals produced, and that he consumed so frequently in order to maintain his athletic frame. The treatments helped lessen the migraines considerably, and the end of the war presented Trosky with one more opportunity. He accepted a White Sox offer of a contract to play in 1946. Trosky hit only .254 with two home runs and 31 RBIs. Despite Chicago’s offer of $25,000 to suit up again in 1947, the 34-year-old Trosky knew it was time to hang up the spikes. His baseball career complete, he was able to devote more of his time to the infinitely greater demands of being a father not only to Hal Junior, but also to sons James and Lynn and to their youngest, daughter Mary Kay. After his official release as a player in February 1947, Trosky rejoined the White Sox as a scout. Between 1947 and 1950, he traveled the tiny towns of eastern Iowa looking for “the next Trosky.” In 1947 he also managed a semipro team, the Amana Freezers, sponsored by Amana Refrigeration. That team consisted largely of former University of Iowa baseball and football players and included future Milwaukee Braves second baseman Jack Dittmer and NFL Hall of Famer Emlen Tunnell. The Freezers went 27-2 and just missed qualifying for the Amateur World Series in Kansas. Trosky left the Freezers the next year, and the White Sox in 1950, to settle down on the farm (he owned two over the next 25 years) before taking up agricultural real-estate sales around Cedar Rapids in 1962. Trosky was, in many ways, a typical Midwestern man. He raised his family with a firm sense of discipline; he hunted, played cards, and went to church. His primary contact with baseball in his later days came through the Iowa High School Baseball Coaches Association. The archives of that organization, later run by Trosky’s nephew Harold “Pinky” Primrose, show that he was an active lecturer for many years until the mid-1970s. Trosky suffered a heart attack in early 1978 and by 1979 was moving around only with the support of a cane. On June 18, at the age of 66, he collapsed in the kitchen of his Cedar Rapids apartment. The doctors said the heart attack was so massive that Trosky was dead by the time he reached the floor. He is buried in St Michael’s Cemetery on a hillside overlooking his hometown of Norway, Iowa. 1 Gordon Cobbledick, Cleveland Plain Dealer, clipping from 1935 on file in the archives of the National Baseball Hall of Fame, Cooperstown, New York (date of clipping unavailable). 2 Tait Cummins, Cedar Rapids Tribune, June 2, 1949, 8. 3 Tait Cummins, Cleveland News, clipping from 1951 in private scrapbook archive of Susan Volz, Norway, Iowa. 4 Tait Cummins, Cedar Rapids Gazette, February 19, 1942, 17.